What would happen in a world where women didn't exist? That's what people around the globe on Wednesday will attempt to demonstrate by taking part in one of the largest-ever International Women's Day protests. "A Day Without a Woman," also deemed the Women's Strike, encourages participants to skip work or school and avoid purchasing anything in stores or online to show just how critical a role women play in society. The protest, coordinated in part by the same leaders of the January 21st Women's March on Washington, aims to illustrate "the economic power and significance that women have on the U.S. and global economies," according to the organizers. More than 50 countries around the globe have events scheduled in Hong Kong, Bosnia, Senegal, Cambodia, Pakistan, Guatemala, and more, according to a Facebook event page for the International Women's Strike. On a local level, nearly 400 separate rallies and marches are planned in cities and towns around the world. According to the most recent data from the United Nations Educational, Scientific and Cultural Organization (UNESCO) Institute for Statistics, women made up 87 percent of U.S. elementary school teachers in 2014. That helps explain why in some states, entire school districts will close Wednesday. School districts are closed in Chapel Hill, NC and Alexandria, VA because so many teachers have asked to participate in the Women's Strike. In Brooklyn, NY, a preschool sent a letter to parents saying it supports teachers who are calling in to work because it shows kids "we do actually practice all that we teach them." The American Federation of Teachers and several smaller local unions also have members participating in rallies. The Philadelphia Federation of Teachers will be picketing schools on Wednesday to protest "five years without raises," and the Chicago Teacher's Union told NBC News its members would be rallying that evening. American Federation of Teachers President Randi Weingarten told NBC News that Wednesday isn't an AFT strike "in the traditional sense," but a teacher who wants to participate would be making an "individual decision." Weingarten will be speaking at the Women Workers Rising rally in Washington, DC. Events are also taking place at colleges. Ghazala Hashmi, a faculty engagement coordinator at Reynolds Community College in Richmond, VA, told NBC News the school granted teachers permission to hold a rally on campus. "We rally for the rights of girls and women throughout the world," said Hashmi, "To quality education, medical resources, and social and legal protections from sexual violence and gender oppression." In North Carolina, contentious protests have been taking place for the better part of a year in response to then-Gov. Pat McCrory's signing of an anti-LGBT law in early 2016. House Bill 2 (H.B. 2) is one of many issues that Ensemble of North Carolina community organizer Tiffany Lloyd expects to be raised at a Wednesday rally in Greensboro. "H.B. 2 not only negatively impacted LGBTQ+ people," Lloyd said, "It also took away labor protections, recourse for sexual harassment protections and negatively impacted the disabled." Lloyd said she expected a wide range of participants based on organizers who are "overwhelmingly women of color and queer women," who are "looking toward an intersectional feminism at this strike." In San Francisco, nearly 300 people signed up on a Facebook event page to strike against gender itself. The "Gender Strike! Bay Area" plan to march to the city's ICE headquarters and "build a wall around ICE" to protest deportations. 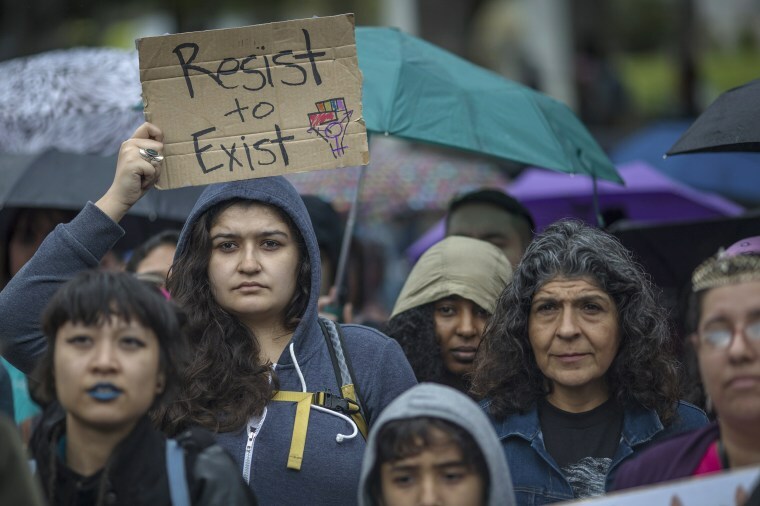 "As feminists," read a statement on the event's Facebook page, "We see the struggle against ICE, against deportations, against borders, imperialism, and nationalism, as deeply intertwined with and crucial to the struggle for gender liberation." In Miami, a group is organizing a "Femmes Day of Resistance" for feminine-presenting people of all genders. Organizer Megan Shade told NBC News that Miami Femmes Coalition has several platform points including seeing Miami-Dade County become a sanctuary city for undocumented immigrants and for an end to "gender violence." "We are strong and together are a powerful force," said Shade. "The future is femme. And we are just getting started." January's Women's March attempted to avoid partisanship, inviting conservative and liberal women of all backgrounds to take part. But over a month after the inauguration of President Trump, Women's March co-founder Bob Bland told NBC News the "misogynist views and actions of the Trump administration transcend partisan politics." "What we’re seeing is a threat to women overall and to our democracy," said Bland. "We would need to do this regardless of who’s in office." Reproductive rights advocates like Planned Parenthood and the National Abortion Federation will be protesting in D.C. at the "Resist Trump/Kill the Gag" rally. The groups slammed the so-called "Global Gag Rule" that Trump signed on January 24, which bans health care providers worldwide from discussing abortion with patients if they receive U.S. funding. Also in DC at the Women Workers Rising rally, protesters will stand outside the U.S. Department of Labor building and ask the Trump administration for an "end to workplace violence and harassment and to promote pay equity, one fair living wage, paid leave, and labor rights at work," according to a statement on the event's website. Because some women are skipping work, the subject of pay equity is prominent. Lloyd said one goal shared by North Carolina protesters is "not only for women to get equal pay, but also a living wage of $15 an hour." Taking a day off of work isn't possible for everyone, and the Women's Strike has faced criticism as some have dubbed it 'A Day Without Privileged Women.' The strike's organizing team in the U.S. has responded to the critics by pointing out their own diverse backgrounds. Mauren Shaw @qz: a privileged woman attacking a strike organized by unprivileged, working class and black women. Distasteful. Lloyd also rejected arguments that striking was a "privileged" move. "It’s a patronizing, liberal statement to say that only women of privilege can take part," said Lloyd. " We have to go forward and upward — the constant criticisms aren’t helping. Nobody’s perfect, nobody gets it the right the first time. It’s just that something has to be done." The Fight for 15 movement, which advocates for a living wage for fast food workers, took part in a Sunday rally in Los Angeles for International Women's Day — one that may have been necessary for some working women that can't afford to strike. The National Women's Law Center, which advocates for equal pay and conducts research into the wage gap, announced in a blog post that it would be closing its office Wednesday to allow employees to participate in the strike.